Michael Shenton goes over for the opening try for Castleford Tigers against Leeds Rhinos. Picture: Tony Johnson. Castleford Tigers showed some slick attacking and defended well late on to withstand an attempted fightback from their hosts as they won their final pre-season game 26-24 against Leeds Rhinos at Emerald Headingley. 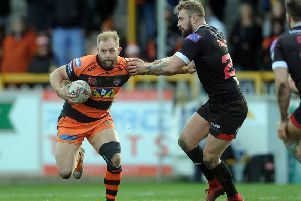 A competitive game between two strong sides saw the Tigers run in six tries, but new signing Jordan Rankin was only able to add one conversion, which left them holding on at the end. Five different players crossed the line for Cas with winger James Clare scoring twice. After their week of warm weather training the Tigers started well with a good handling move ending in Michael Shenton going over for the first try, to which Rankin added his only goal. Only some last ditch defending denied them a second score as Jesse Sene-Lefao was held up over the line. But it was Leeds who scored next with centre Kallum Watkins planting the ball down over the line to score in his testimonial match. Castleford fired back as Clare collected Jake Trueman’s well judged kick to make it 10-4. The Tigers continued to look good and Trueman began another left edge move, the ball was carried on by Peter Mata’utia and Shenton before Clare raced over for his second try. The lead was stretched when Clare knocked down another good Trueman kick and Junior Moors pounced to score. But Leeds cut the deficit to eight points just before half-time as Adam Cuthbertson produced a strong run to score and Tuimoala Lolohea kicked his only conversion. After their excellent first half the Tigers were not so dominant after the break and Leeds scored their first try within five minutes of the restart, Harry Newman gathering up a loose ball from Lolohea’s kick to score wide out. As in the first half it was end to stuff at times and the Tigers stretched their lead again when Rankin’s fine break was backed up by Alex Foster to score. The Rhinos were quickly down the other end and Ash Handley was next to go over for a try. The entertainment continued with Cas scoring again when Paul McShane smartly went over from acting-half. Still it was not all over as Handley went in for his second after taking Konrad Hurrell’s pass. With Cameron Smith kicking a conversion from wide out it was 26-24 with 15 minutes to go. But Cas held out against strong pressure in the closing stages and held on for a morale-boosting victory. Scorers - Leeds: Tries: Watkins, Cuthbertson, Newman, Handley 2; goals: Lolohea, Smith. Castleford: Tries: Shenton, Clare 2, Moors, Foster, McShane; Goal: Rankin. Leeds Rhinos: Walker; Newman, Watkins, Hurrell, Handley; Lolohea, Myler; Peteru, Parcell, Singleton, Ferres, Sutcliffe, Merrin. Subs: Cuthbertson, Ward, Dwyer, Oledzki, Jones-Buchanan, Smith, Donaldson. Castleford Tigers: Mata’utia; Minikin, Foster, Shenton, Clare; Trueman, Rankin; Watts, McShane, Millington, Sene-Lefao, McMeeken, Massey. Subs: Milner, Moors, Cook, Clark, Aston, Turner, Clarkson.